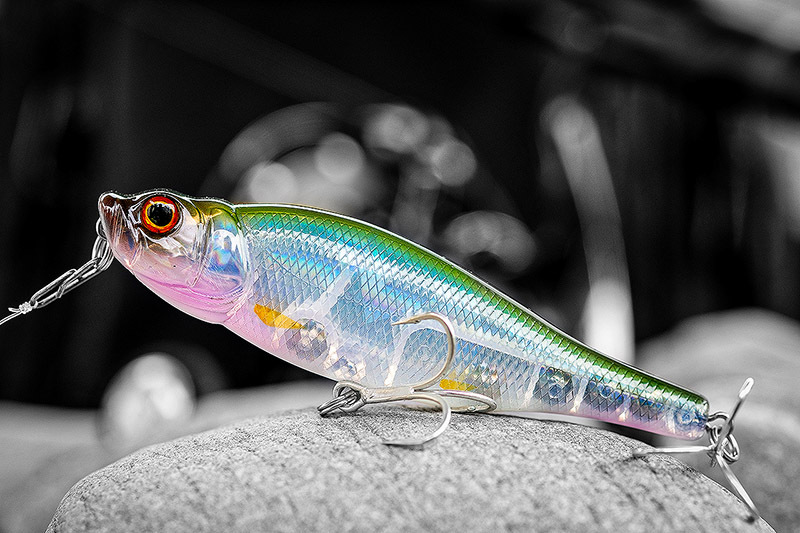 I am sure you are no different to me in that you use certain lures more than others firstly because they have caught well for you in the past, and secondly because you or I then naturally believe that they are a bit better than other similar lures. Confidence is of course key - and I would suggest that it is of particular importance when you are lure fishing - but if you dial it down and think about it, how do you actually prove whether one lure really is better than another lure? It matters not really, but it always interests me when various anglers rave about certain lures working so well for them and a part of me often wonders whether a different lure might have worked even better and so on - and I am in the same boat here. You can only catch with what you have on of course, and if you or I have a good session and/or catch a particularly good fish then it’s pretty obvious that the lure we had on was working well, and also that because it did, we will naturally turn to it again and think to ourselves how much better it is than another lure - and so on. So yesterday morning we were out fishing and Mark and I gravitated towards our rucksacks at a certain point to grab some coffee etc. I happened to have the Whiplash Factory Spittin’ Wire surface lure on the end of my clip and I happened to say to Mark how much this lure had become my go-to surface lure and that it was a frigging killer and so on (this is not a blog post about the Spittin’ Wire because you could insert a number of different lures into the mix here and I am sure a number of you have similar stories) - but is it really a better surface lure than other similar lures though? Well it doesn’t matter because I chose to buy some and you don’t remotely have to, rather that I have come to firmly trust in this surface lure because it has caught me a number of decent bass fish this year in estuaries and on the open coast, in the UK and over in Ireland. You most likely have a lure in your armoury that you like as much as I like this Spittin’ Wire, and so on. And I said to Mark yesterday morning that damn was I glad I trusted in that kind Spanish angler who told me about this surface lure earlier in the year, and I was glad I took the punt and bought a couple, but that although the lure had worked well for me (and for Mark I might add), at the end of the day could we really be sure that there was something a bit special about this Spittin’ Wire because you can only fish with the one lure, and would another lure have produced the various bass for us? That’s just it - you will never quite know, but Mark did say something very interesting yesterday morning. He told me to think back to a couple of sessions where we were fishing close together and I had recently bought my first ever couple of Spittin’ Wire lures and Mark hadn’t yet. I must admit that numbers and sizes of bass tend to blend into one overall experience for me, but Mark pointed out the fact that on those particular couple of sessions I had not only outfished him, but the bass I caught were noticeably bigger than the ones Mark caught. I was fishing with my new Whiplash Factory Spittin’ Wire surface lures, and Mark was fishing with the Tackle House Vulture and the Xorus Patchinko 125 he told me - two surface lures I happen to like as well but I’ll still take the IMA Salt Skimmer. Now you know me by now I would hope - I don’t compete with my fishing and it bothers me not who catches the most of the biggest fish if at the end of the day we have had a blast. Even better for me if the light goes off and I can nail some photographs that float my boat. I hate seeing it when anglers get all arsey with each other because so and so catches more or bigger bass and they end up begrudging their mate’s success, but I guess that fishing does it for us in many different ways. Anyway, so Mark was saying to me yesterday morning that he did his utmost to ignore the fact that I had been fishing with a different surface lure for those couple of sessions in particular, because most of us have quite enough lures already and do we really need many more? No comment! Seriously though, I have a bunch of different surface lures here at home that have all caught bass for me, so did I really need to buy a couple of those Spittin’ Wire ones? Whatever the case, it obviously got Mark thinking - we were fishing close together, but I happened to catch more and bigger bass and the one variable seemed to be the lure. So Mark did what many of us here would do, and me very much included - he bought some of those Spittin’ Wire surface lures himself, which now means that we have often been fishing the same surface lure at the same time on the same marks, so this then takes that “different” lure factor out of the equation. But Mark has caught a number of big bass now on the lure and a while back landed his second biggest shore caught bass ever at 76cms long. So when Mark and I both ended up raving to each other about how well the lure had done for us this year and of course how killer we believe it to be, I guess that for us it’s all the “proof” we need - because of course there is nothing remotely scientific here and you can only catch with what you have on. As I said earlier, insert your lure of choice in here and I am sure loads of you have had similar experiences. Ask either one of us though and we’re going to tell you that in our opinion this particular surface lure is absolutely lethal. But why? Now that’s another story and Mark has an interesting theory! More to come………. Disclosure - if you buy anything using links found in this blog post or around my website, I may make a commission. It doesn’t cost you any more to buy via these affiliate links - and please feel entirely free not to do so of course - but it will help me to continue producing content. Thank you. And please note that there are no links here to this Spittin’ Wire lure, but a little birdy tells me that the Art of Fishing do have a bunch of them in the shop but that they are not putting them on the website. Do with that info as you will, because I know I am!